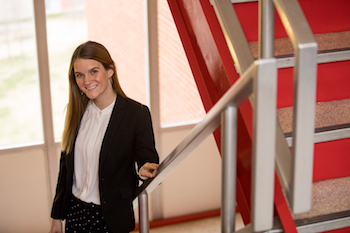 Hope Thompson, a Strategic Marketing graduating senior from Birmingham, Alabama, has made her mark within the Gordon Ford College of Business through networking and getting involved. Her role with the WKU ENACTUS entrepreneurship team has enabled her to make a tangible impact on the Bowling Green community. Another project Thompson and the ENACTUS team has been working on is called Project Job Bus. “Manufacturers in Bowling Green have a problem that a lot of the people that they want to employ can’t get there, so we have had multiple meetings where we are trying to acquire a van so that we can provide a means for people to get from point A to point B, for refugees especially, who are a huge pool for that service,” she explained.